In my last post I wrote about the trauma surrounding my cancer diagnosis. In spite of mostly negative consequences of living as a “cancer survivor” there were a few positive occurrences. For example, meeting special people I would have never encountered under normal circumstances. A month after my mastectomy I joined a cancer support group hosted by a woman with lymphoma in her large Victorian home with a wrap around porch in Chevy Chase, Maryland, not far from where I had worked at the National Institutes of Health. Three of the seven regular members had had breast cancer. The other four had a variety of other cancers. At the start of each meeting we held hands in a circle while Gregorian chants played in the background, the music soaring up to the ten-foot ceilings and swirling about the large elegant living room. The leader asked we pray for those present and not present that were still struggling with treatment, suffering with pain or hoping for remission. Then in silence we made our own supplication. Invariably, as I stepped on the polished hardwood floors to take a seat, I felt a peace settle over me. Besides the seven group members, other women sporadically attended our meetings. Once, a young woman sat along side of me on the flowered sofa. In front of us, on the glass and chrome coffee table, a snow-white amaryllis sprouting from a bulb set in a deep blue planter. Young, thin, with long dark hair, the woman spoke about the aggressive breast cancer that would soon end her life. She had a husband, pre-school children and a hunger to live. She mesmerized me with her research to find a cure. Depleting resources in the area, she found a practitioner in another state and made plans to drive to see him later that week. As she spoke of her hope to halt the cancer’s progression, she stopped mid-sentence. Noticing my rapt attention, or my agonized expression as I listened to her frantic search for a cure, she reached over and clutched my hand. “Don’t worry, your cancer is not as bad as mine.” I squeezed her hand back, unable to speak for I was so touched by her gesture. Afterwards, I walked down the porch steps and into the winter chill, feeling a bit of survivor’s guilt that my cancer was not fulminating. Eventually, I dropped out of the group. 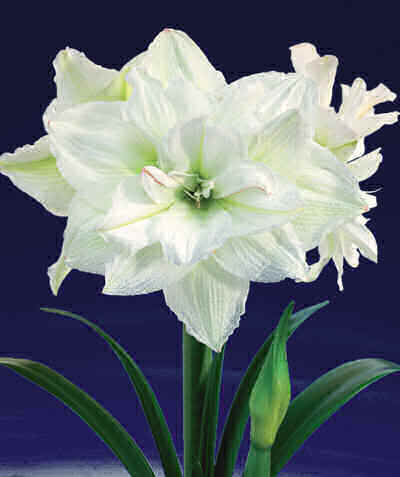 Each time I see a white amaryllis, I recall the women in that group and their strength, especially the young mother. Her generous comment and concern for me even as she frantically detailed her quest for a cure still overwhelms me. I never did find out what happened to her. I want to believe on the out-of-state trip she found a curative regime and is now enjoying her grandchildren, putting all the trauma of her cancer behind her. Dear Marianna, thank you so much for sharing such a poignant story. At times, silence speaks.Your look apparently conveyed compassion,love and concern to that young woman.In my vocation as a hospice nurse, I also witnessed many brave, dying patients who were so comforting to their friends and family-even when they were the ones who needed comforting.Keep the hope that the person who touched your life at that moment did survive and is doing well. If not, when you see a white amaryllis, it’s a sign that she’s thanking you for caring. (Is that too corny?) Working with dying people really made me appreciate the mysteries and “coincidences” or “Godincidences” as I call them ,that we experience. Yes there is much that is unexplainable when dealing with life and death issues. I, too, have witnessed serendipitous or coincidence occurrences. So not corny at all. Thank you for your thoughtful response. I have always believed she deserved to life a full long life. Thanks for your comment. Lovely post. I think it’s redemptive to find something good in something bad. And the word and experience of “cancer” is just so bad. I’m thankful for these group members in your life. And the symbol of the flower, its whiteness and purity, is perfect. Funny how some things, a flower, can trigger the same memories consistently. Once again, you’ve raised awareness of the emotional turmoil around cancer treatments beyond the hospital. Hearing of a community of survivors like this, including the younger woman, moves all of us to a deeper sense of compassion and love. I, too, can only hope everyone experienced renewed health and healing. Thank you for sharing this. Thank you for commenting, Linda.